"World class musicians with passion and a healthy sense of fun, keeping alive and making accessible the very heart of the tradition itself." - Mojo Magazine"
...as close to perfect as it gets in an imperfect world." - Sing Out! Born of a session in Paisley, Scotland and named for the town's historic weaving industry and local poet laureate Robert Tannahill, the group has made an international name for its special brand of Scottish music, blending the beauty of traditional melodies with the power of modern rhythms. Over the years the Tannies have been trailblazers for Scottish music, and their tight harmonies and powerful, inventive arrangements have won them fans from beyond the folk and Celtic music scenes. They are firmly established as one of the premier groups on the concert stage; from reflective ballads to footstomping reels and jigs, the variety and range of the material they perform is matched only by their enthusiasm and lively Celtic spirits. 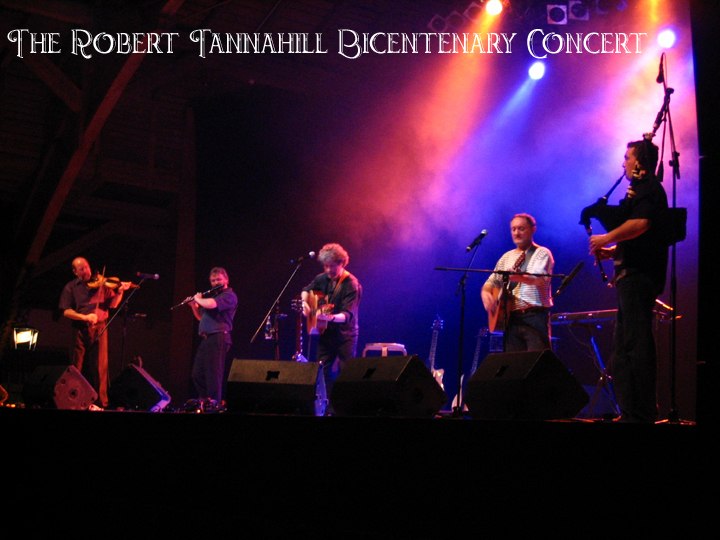 I am proud and grateful, that my great friends The Tannahill Weavers are performing on this special occasion - to mark the 200th anniversary of Robert Tannahill's death, on 17th May, 1810. No other act has spread our bard's name and music throughout the world as much as they have - in fact, for over four decades, they have been "flying the flag" and that is exactly why I booked them. Appropriately and fittingly, this concert takes place exactly 200 years after Tannahill's burial at Castlehead Church, Canal Street, Paisley on 21st May, 1810. I see this event as an opportunity for us to commemorate Robert Tannahill and celebrate the wonderful songs and poems that Paisley's premier poet contributed to Paisley's pride and Scotland's cultural heritage.